Memorial Day has come and gone and summer is officially here! And while all the health mags I’ve been reading assume that we are all in bikini shape– I don’t know about you – but I’m still working on it! For me, when I think about summer, I think about fun mini “vacations” that D and I take to get out of steamy, muggy NYC. But traveling poses a unique type of dilemma when you’re trying to stay fit and healthy. Being out of your home environment makes it a lot more difficult to control where you get your next meal from – and if the greasy spoon is your only option on the road…well the name says it all doesn’t it? Also, long hours in a car or bus doesn’t lend itself to getting in some good old exercise. Believe it or not, it is possible to completely ace your weekend travel plans on the health front. Here’s the answer: PREPARE! I cannot stress this word enough – and it is in fact a tenet of my general healthy philosophy – that being prepared is the best way to ensure that you are putting the highest quality fuel in your tank. Pack a snack. You know how your mom used to carry snacks in her purse for you when you were a toddler – she was on the right track to keeping you healthy! 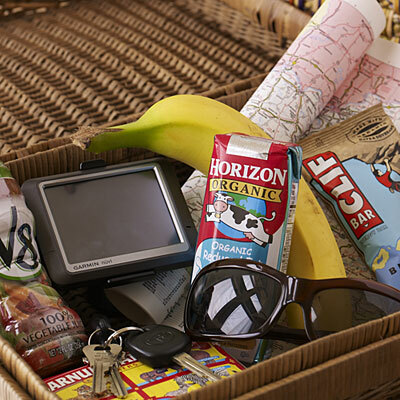 If you’re in the car – pack some healthy goodies in a cooler – a couple greek yogurts, apples, raw veggies with hummus. I’ve been known to pack a salad with me to bring on an airplane (I promise you it tastes SO much better than the dreck they call airplane food). Additionally, if you are stranded with no healthy options for your next meal – a couple snacks can turn into a quick mini-meal in a flash. Scout out your location. Many hotels these days have fitness centers or deals with local gyms. If not, I’ve been to many hotels where they are happy to point out great running loops (all you need to pack is a pair of sneakers!). Some of my best memories from traveling are when I went running through a new city – it’s a great way to explore and get your bearings. Additionally, check out the restaurant scene – are there any great, local, organic spots? Not only is this a chance to get your greens in – you can get a good flavor of the city you’re in. Drink up. No, not booze! Staying hydrated with water is crucial when you’re traveling. Not only is traveling dehydrating to your system – dehydration is often mistaken for hunger, which can cause you to overeat. Also make sure to eat plenty of fruits and vegetables – whose water and fiber content can help keep you full. Speak up. When you’re traveling – especially if you’re visiting family or traveling with friends – I find that it’s really helpful to make your voice heard when it comes to health. Let your travel partners know that you want to be active – even invite them on a run with you! Let them know that the burger joint they may have picked for dinner doesn’t really have a lot of options for you (although you can find a salad or veggie burger in the oddest of places!). You’d be surprised by how many friends/family are your health allies in this and have similar goals in mind! Remember that ultimately, the best advocate for your own health is yourself.